This page contains some of the key findings from the MRC CFAS study. To read the results in more detail please click on the finder headings. Prevalence of Dementia in England and Wales – estimates suggest that around half a million (543,000) people in England and Wales would be expected to be suffering from dementia of mild or greater severity. Prevalence of Dementia in Institutional Care – 326 of the 571 individuals living in institutions had a diagnosis of dementia. These 326 people accounted for 34% (95% CI 30-39) of all individuals with dementia aged greater than 65 years identified by CFAS. Alcohol and smoking (never, past and current) were neither strongly protective nor predictive. Exposure to general anaesthesia (GA) was inversely associated with dementia development with a trend with increasing GA exposure; P = 0.003. More disability-free years were gained than total life years in persons free of stroke, cognitive impairment, arthritis, and/or visual impairment at baseline. This finding suggests that elimination of these conditions would result in a compression of disability. The initial population sample was drawn from registers of general practitioners and a random selection was carried out to recruit at least 2,500 individuals in each centre. The prevalent cases were identified in two stages. The entire study sample underwent a screening interview to pick up potential cases, and those potential cases then had a more detailed assessment. The initial population sample was drawn from registers of general practitioners (Family Health Service Authorities lists) and random selection was carried out to recruit at least 2,500 individuals in each centre. The prevalent cases were identified in two stages. The entire study sample underwent a screening interview to pick up potential cases, and those potential cases then had a more detailed assessment. Table 1 below shows the results of this prevalence study. The prevalence of cognitive impairment and dementia did not show much variation across the centres examined in the study, so the combined prevalence data is generalisable for the national population. Standardised to the England and Wales population estimates for 1991 the overall prevalence of dementia and above in the 65 years and over population was 6.6% (95% CI 5.9-7.3). These estimates suggest that around half a million (543,000) people in England and Wales would be expected to be suffering from dementia of mild or greater severity. The CFAS study collected information on place of residence for the 13,004 participants interviewed in 1991-3. 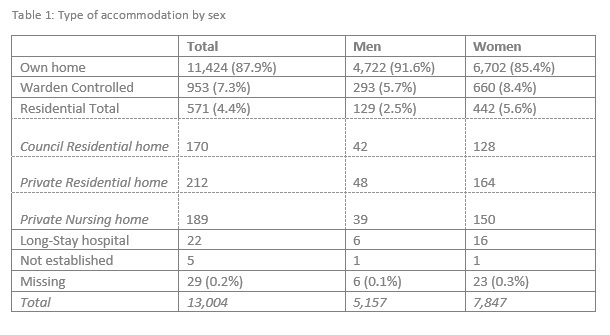 Most individuals were living in their own homes (Table 1) with only 571 (4.4%) living in residential or nursing homes. The standardised prevalence of dementia in residential and nursing homes was found to be 62% (95% CI 52-71) – including cases of dementia where there was a main diagnosis of depression or anxiety. The prevalence was slightly higher in women than in men, with no increase by age. There was no significant difference in prevalence of dementia between the types of home. 326 of the 571 individuals living in institutions had a diagnosis of dementia. These 326 people accounted for 34% (95% CI 30-39) of all individuals with dementia aged greater than 65 years identified by CFAS. Incidence measures the number of new events or cases of disease that develop in a population of individuals at risk during a specified time interval. CFAS published estimates of the incidence of Dementia in England and Wales in 2005. The study used identical methods in five sites, two in rural areas and three in cities (Cambridgeshire, Nottingham, Gwynedd, Newcastle and Oxford). Each of these sites has different prevalence of risk factors and mortality rates. 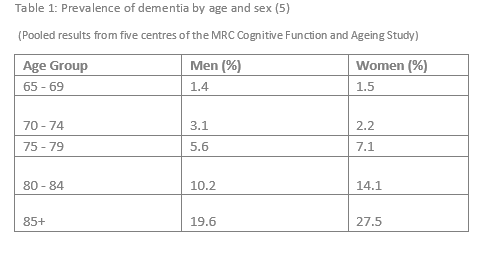 Table 1 presents the incidence rates for dementia found by the CFAS study. The results show that the increase in incidence with age is marked for both sexes, and continues into the oldest age groups with no tailing off. There was no convincing evidence of variation across the different centres and the incidence rates did not reflect the variations in the prevalence of possible risk factors in these sites. CFAS investigated a number of potential risk factors for dementia. Conclusion: in this large multicentre and long-term population-based study, some well-known risk factors for dementia, of vascular and Alzheimer’s type, are confirmed but not others. The association of increasing age with the development of dementia is several magnitudes greater than the other factors in the study (OR of 25.6). Ageing of populations is likely to result in an increase in the number of people dying with dementia even in the presence of preventative programmes. The association between self-perceived health—a robust predictor of later health outcomes—and incident dementia warrants further study. MRC Cognitive Function and Ageing Study, Agustin G. Yip, Carol Brayne, and Fiona E. Matthews. Risk factors for incident dementia in England and Wale: The Medical Research Council Cognitive Function and Ageing Study. A population-based nested case-control study. The consequences of diseases in later life have been judged predominantly through mortality, resulting in an emphasis on the fatal rather than the nonfatal disabling conditions. We use a longitudinal study with follow-up at 2, 6, and 10 years to assess the impact of different diseases on both total life expectancy (TLE) and disability-free life expectancy (DFLE). The Medical Research Council Cognitive Function and Ageing Study investigators interviewed 13,004 people aged 65 years and older from five U.K. centers starting in 1991. Persons aged 75 years and older were oversampled. Disability (mild, moderate, and severe) was assessed through basic Activities of Daily Living (ADL) and Instrumental ADL (IADL) scales at baseline and at follow-ups at 2, 6, and 10 years. TLE and DFLE were compared for persons with and without each of nine conditions. Results: At age 65, men had a TLE of 15.3 years of which 12.1 (79%) were free of any disability, whereas women of the same age had an average TLE of 19.4 years, 11.0 years (57%) disability-free. Men (women) aged 65 years without stroke had 4.8 (4.6) more years of TLE and 6.5 (5.8) more years DFLE. Without diabetes, men (women) lived 4.4 (5.6) years longer and had 4.1 (5.1) years disability-free. Conclusions. More disability-free years were gained than total life years in persons free of stroke, cognitive impairment, arthritis, and/or visual impairment at baseline. This finding suggests that elimination of these conditions would result in a compression of disability. The Burden of Diseases on Disability-Free Life Expectancy in Later Life Carol Jagger,1 Ruth Matthews,1 Fiona Matthews,2 Thompson Robinson,3 Jean-Marie Robine,4 Carol Brayne,5 and the Medical Research Council Cognitive Function and Ageing Study Investigators.